Dried cranberries taste almost like raisins and are perfect for muesli or as snacks. 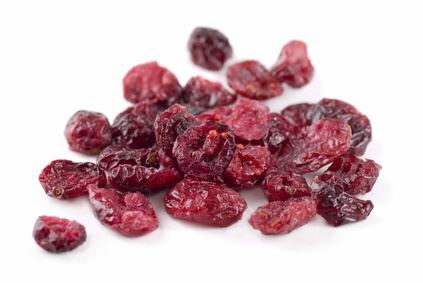 We offer several variants of dried or freeze-dried cranberries in several variants as whole fruit or cranberries soft and moist as bakers slices. The cranberry is a berry shrub type related to blueberries. Their natural home are the raised bogs in the east of North America where they are still grown in large areas. The special feature of the shiny red cherry-sized cranberry are the four air chambers inside the fruit which allow for a special harvesting method of flooding the fields. Fresh cranberries take getting used to, they taste tart and sour, but dried the acid mainly gives way to a sweet aroma.